After bordering hopping without a passport, I decided it was probably a good idea to get a passport. Right after the first trip to Thunder Bay, I went down to the Wood County Courthouse with my birth certificate. I filled out the forms, got my picture taken, and then wrote out a check for the cost of a passport and passport card. Within exactly 3 weeks, I had delivered to me in the mail. With this new passport, I was just itching to use it. I took a Friday off of work and headed up Thursday night at 2PM after I got done with work. I made it to the border and answered their questions about my intentions in Canada. Since I wing it and had no real plans, they decided they wanted to ask me a few more questions inside. I went inside and I was brought into this individual interrogation room. There was this glass window between me and the border agent. After answering a bunch of questions, I was asked for the keys to my car. They promptly searched it and then let me go on my way. It was definitely very cold as it was mid-December. 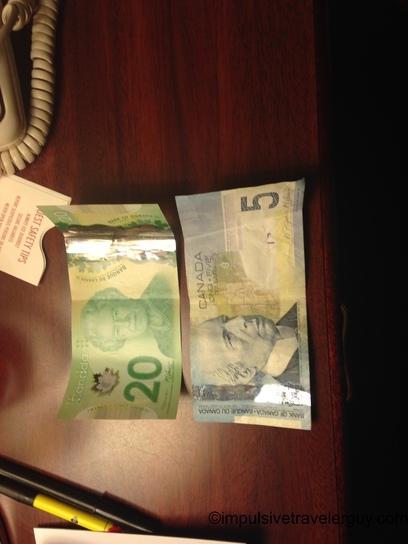 I drove into Thunder Bay and found an ATM to get some local currency. Since my GPS didn’t work out of the US, I stopped at a gas station and picked up a road atlas. It was starting to get late, so I found a Super 8 and got a room for the night. When I woke up the next morning, it was around -20F. I could feel some of the cold through the wall of my hotel room. I ate the complimentary breakfast and started thinking of places to explore. I could overhear some of the other people eating breakfast and how a nearby area got 3 feet of snow recently. They actually said 3 feet so I wonder if they were Americans, like me, or if they still informally used the imperial system. I then drove around a bit and realized how inefficient it was trying to navigate with a road atlas. I found myself by a Walmart. I checked out the Walmart and then went over to the Starbucks to get some coffee. It was attached to a Barnes and Noble like the ones in the US. I noticed that Duck Dynasty was also popular up there as there was a ton of Duck Dynasty things in the Barnes and Noble. Across from the Barnes and Noble was a store called Future Shop. It looked like an electronics store so I decided to check it out since I wanted to get a GPS that actually worked in Canada and not have to continue to rely on the road atlas. When I walked inside, it really seemed like a Best Buy to me. I later found out Future Shop is the Canadian subsidiary of Best Buy. I found a reasonably-priced GPS and then bought it. Now I was free to explore without worrying about getting lost! I decided to check out the mall and do a little people watching. 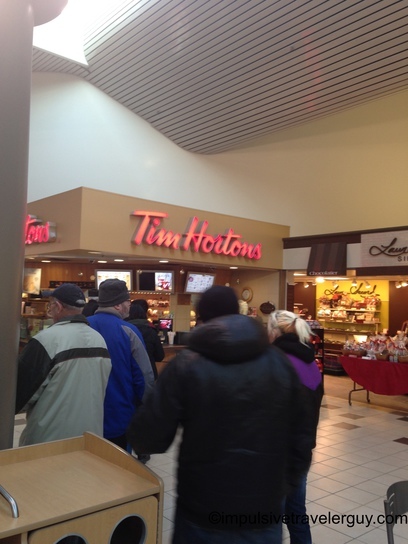 In Canada, Tim Horton’s coffee is popular and I definitely saw that as I watched a continuously long line. I checked out a few stores and I guess I can say I’m one of the Americans who got to see a Canadian Target in the limited time they were open up there. When I was driving, I saw a funny sign for two neighboring businesses that decided to combine their signs. 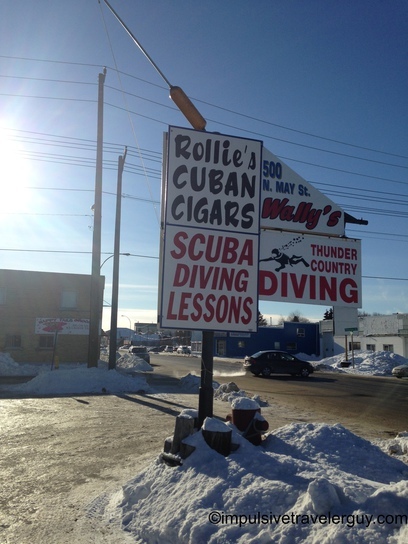 Basically you could get Cuban cigars and scuba diving lessons. What a combination! If the US relations keep opening up with Cuba, maybe we’ll see a few signs like this in the United States. I later dropped by a gun store to see what kind of selection they offered. One thing I noticed between the gun store and Walmart is ammunition was readily available, unlike in the United States. There wasn’t any run to hoard ammunition in Canada so the shelves were stocked with anything you’d need. Walmart also only sold ammunition and not guns. I talked to the owner of the gun shop about guns and the differences between the US and Canada. 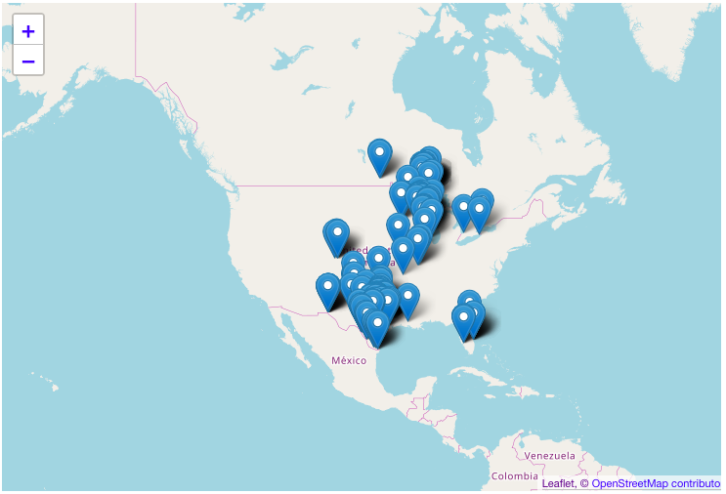 You can pretty much own everything in Canada that you can in the United States but there’s more of a process behind it. You need to get what is called a Possession and Acquisition License (PAL) for normal rifles and shotguns and a Restricted Possession and Acquisition License (RPAL) to own a handgun or AR-15. Unlike the United States, you cannot hunt with an AR-15. You also need an Authorization to Transport (ATT) License to transport a restricted class gun. To obtain a PAL or RPAL, you have to take a firearms safety class and then go through a mandatory waiting period after a background check passes. If everything checks out, the license is then good for 5 years. They basically sell ammunition like cold medicine in the US. You need a PAL in order to buy ammunition and when you buy the ammunition, your PAL number is recorded in a log at the store with the amount you bought. I could write a lot more about this in detail, but that is the basics behind it. I’d love to actually go through the process and learn about it as guns are a big part of American culture and I have grown up around guns so I’d like to compare the differences in more detail. One thing that was evident talking to this gun shop owner was he supported the controls they had in place in Canada. “You don’t want a loony to get a gun,” he told me. This is definitely a contrast with an American gun shop owner that is ardently against pretty much any gun control. After talking to the gun shop owner, I decided I’d go a little further north and explore there. I decided on going to Nipigon, which is about the most northern point of Lake Superior. It definitely did get desolate fast. When I was driving on Highway 11, I came upon big backup of cars. I decided to take an alternative route. On my alternative route, I stopped in a gas station to get a bite to eat and that’s where I heard a horror story about Canadian health care. After talking for a while, I hit the road again. I made it up to Nipigon and checked a few things out. 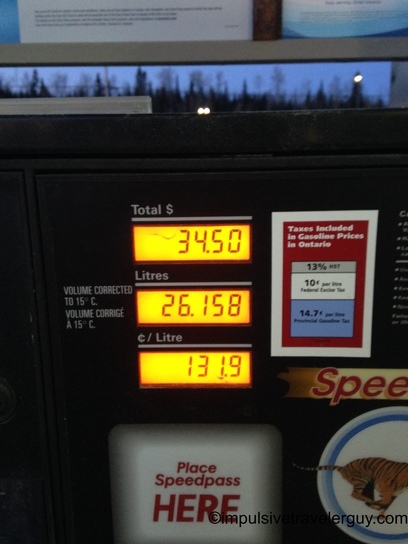 I then realized I should probably get some gas, so I filled up. It’s definitely different seeing the gas volume measured in liters. I was starting to get hungry again, so I stopped at the Tim Horton’s across the road and got a sandwich. After eating, I hopped in the car and decided to drive back to Marshfield. I drove for about 7 hours straight and made it home late in the night. This trip was definitely cool to get some new perspectives on Canadian life and hear about topics like guns and health care.